It is essential to design and even build your engineering structures prior to building your baseboard. If, for example, you wish to incorporate a high viaduct, you may very well have to deepen the baseboard to allow this to happen. I always build these structures on a sub-base that can later be properly attached to the baseboard. 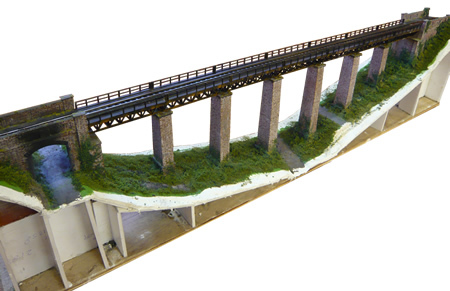 The structure is fully detailed, painted and the track laid. I also complete the scenics around the structure as it is a lot easier to do on the workbench. Notice in the photo below that I have left a lip along the edge which I can later pick up to extend the scenics. I also add thin plywood lips to the end of the trackbed which will be used later for accurately attaching the adjacent trackbed. Most steel bridges are quite challenging to scratch build but many commercial products are available, some ready built and others in kit form. Some beautiful etched products are available from the USA such as those shown below. They can usually be 'bashed' to achieve what you require. The British market can also help. 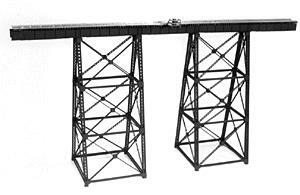 Peco, for instance supply truss bridges and plate girders in both 00 and N scale and further selections are available through their Wills and Ratio product lines. Some examples are shown below. Other sources can be found in our resources pages. 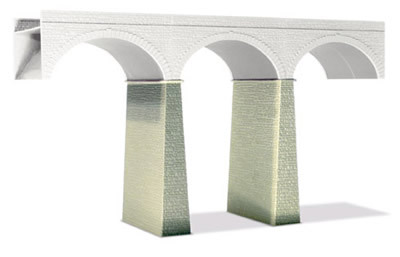 How we built the East Lyn Viaduct can be found here. 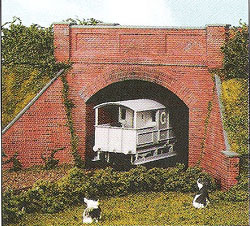 Tunnels are often used on model railway to 'lose' trackwork off scene. Usually, only one side of the tunnel interior is visible. This is fortunate as the unseen part can be omitted, thus giving more access to the track. When designing tunnels, please remember that it is essential to provide access for track maintenance and rolling stock recovery. I miscalculated this at County Gate at one section of the tunnel under the Glenthorne cliffs. Human arms could just not reach one part! This resulted in some interesting moments with a vet's endoscope which must have been in some quite unpleasant places beforehand, followed by some scary moments with a jigsaw! I usually favour building up topography with lightweight blue foam. This method is inappropriate if track is to be hidden below as much better access is required. Here, shell topography should be used, such as plaster bandage laid on chicken wire. hidden tracks inside the tunnels with access holes for maintenance. Nothing looks worse that daylight coming out of a tunnel. Make sure that light can be blanked off from the interior. I often use lightweight black panels which attach with Velcro to seal off access panels. 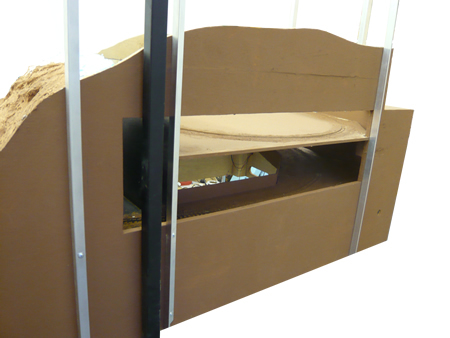 If you are to install a tunnel portal, you do have quite some choice available. 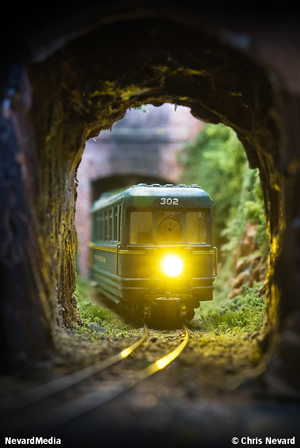 Make sure that the tunnel bore size is appropriate for the rolling stock. Tunnels were rarely built larger than necessary. A very clever way of disguising the exit of track from the viewing side. 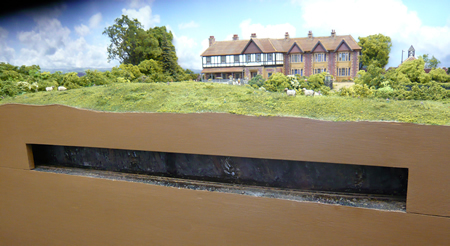 Behind the backdrop is an additional small section of scenery before the track runs into the hidden fiddle yard. The edges of our layouts are effectively sectioned right through the Earth's crust and somehow our eye accepts this. 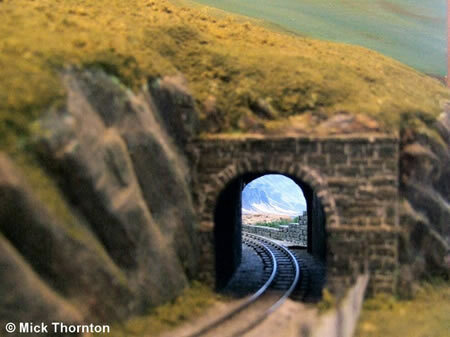 If alongside the 'edge of the world' is a hidden track, then one can display the inside of the tunnel; a most unusual view. We decided to do this on our hotel model. The trains become visible to visitors in the unique environment of the inside of a tunnel. Hopefully, most people have not entered into a working railway tunnel and long may it remain so! 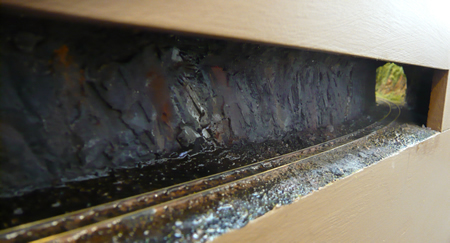 Once we had decided where the tunnel would be sectioned, the first job was to fabricate the tunnel wall. This was done in foam board covered with Polyfilla which was moulded and subsequently carved into hewn rock. The plaster was painted in dilute acrylics and then with weathering powder. Once the rock wall was fitted, the track was ballasted and talus was scattered in places to represent rock falls. Again, the track and ballast was painted and then clear epoxy resin was used to paint on wet walls and pools of water in the ballast. Once cured, I painted over the epoxy with glass varnish, which looks better at the edge of puddles, being much thinner than epoxy. A unique view of the tunnel mouth from the inside. The pools of water lying in the tunnel can be clearly seen.